What does Seattle’s next schools chief need to know? Share your questions for the finalists with us. A coalition of community groups and the principals’ and teachers’ union have urged the Seattle School Board to slow down its search for a new superintendent. What do you think the next schools chief needs to know before taking the job? What would you ask potential finalists? The Seattle School Board may soon hire its fifth superintendent in a little over 10 years. Last fall, the Board quietly opened its search to find a replacement for Superintendent Larry Nyland, who took the helm of the state’s largest school district in 2014 and whose contract expires in June. But since then, the Board has held just one community event to gather ideas on who should oversee the education of more than 54,000 students. As of Tuesday, a consultant handling the search still had not posted an application for the job but still expects the Board to make a final decision by late March. In a letter sent to the Board last week, nearly three dozen leaders of community and educational organizations described that as a “very aggressive timeline” and urged the Board to either slow down the process or postpone it altogether. The principals’ and teachers’ unions went a step further and, in a flier handed out at the Board’s first and only town hall on the search, asked for an extension of Nyland’s contract to allow for more time. About three dozen people — many of them Board members and districts administrators — attended the Jan. 18 event at Nova High School in the Central District. “The process to hire a new superintendent has been rushed and filled with missteps,” the unions’ flier said. The district also posted an online survey, asking respondents to rank the qualities they want to see in Seattle’s next schools chief. About 2,100 people responded. The community groups, some of which met with the search firm, criticized those efforts as insufficient. “The two-and-a-half month timeline does not allow adequate time for community input and engagement beyond tokenizing efforts,” their letter said. “One town-hall and one survey do not meet the benchmark for authentic engagement,” the letter added. Some Board members appeared to hear such criticism during a work session late Tuesday and wondered why the search firm, Ray & Associates, didn’t work harder to collect feedback from communities of color. About 70 percent of the survey respondents identified as white, while less than half of Seattle students identify as white. Still, Board members voted to move forward with their original timeline to hire Nyland’s replacement — with tentative plans to reach out to more communities before the application closes Feb. 28. The names and resumes of all applicants will remain private, according to Board President Leslie Harris, until a series of public interviews with the finalists in late March. A decision on the lone finalist could come soon after, by March 26, according to Ray & Associates. In the meantime, we want to hear your thoughts. 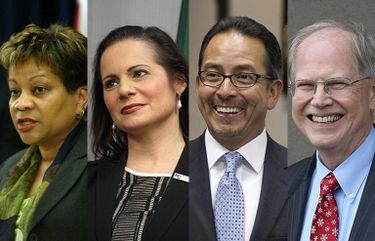 Whether you have a child who attends Seattle schools, work for the district, pay taxes into the district or are a student yourself, what’s the most important question you think the School Board should ask potential finalists for the city’s next superintendent? Is there anything unique about Seattle and its schools that candidates should know before applying for the job? And, since it was a top-ranked quality on the district’s survey, how should a new schools chief respond to Seattle’s ethnically and culturally diverse student population and community? Please submit your questions and thoughts using our online form, responding in a comment below or emailing nmorton@seattletimes.com. Your questions and comments could be used in a follow-up story. The Seattle Times will be watching the superintendent search closely, and hope you’ll be part of this community conservation.